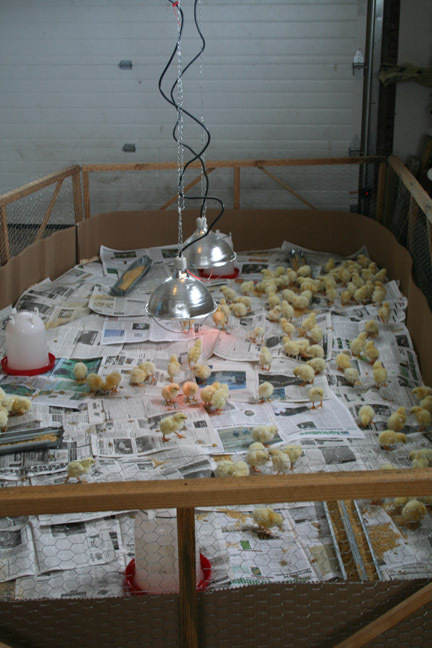 Chicks will pick a sunny spot on the floor over heat lamps every time. 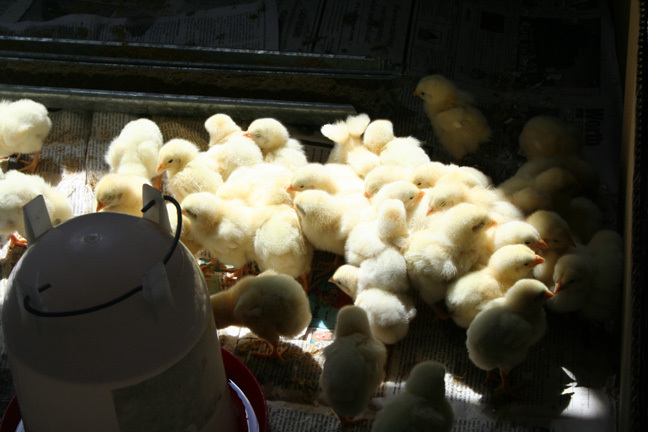 Chicks arrived last week Thursday – 128 of them! And I have a new brooder guard, courtesy of my dear husband. We start chicks in the garage attached to the house. In the past we’ve set up the cardboard guard and then surrounded that with chicken wire. But it was quite flimsy. By the time the birds were ready to go to pasture they’d usually trampled down the wire and there were chickens (and litter and dust and down) all over the place. The cardboard and wire would be destroyed and have to be thrown away. Matt had some homesawn boards made out of old power poles (something he has lots of access to as a lineman) so the materials didn’t cost too much. He ripped these down into 2-by’s and made 6′ x 2′ “frames”, crossbraced, with chicken wire stapled to one side. He added L-brackets at the bottom of each panel for stability. The panels are hinged together into whatever configuration we need. We made a 2-panel by 1-panel rectangle, for a total of 72 square feet of brooder space. The cardboard liner goes around the inside of it to cut drafts and keep the litter inside the brooder. I figure we could start up to 150 chicks in that area for up to 3 1/2 weeks. And if we need it larger it’s easily added onto. It will break down and stack neatly out of the way, and no more buying chicken wire every year! After this picture was taken I did add a third heat lamp. Two wasn’t quite enough to keep everybody warm. It sure doesn’t look like 128 chicks, does it? it sure will seem like 128 in a couple of weeks. at two weeks old we just put our 31 chicks outside. four times the volume of box was necessary to move them. Karl – I never think it looks like we have as many as we do. I count them as we unpack them from the hatchery, I count them when we load them out of the garage (into the livestock trailer) and onto pasture, I count them when we load them out of the pasture (into the livestock trailer again) and again at the processor. Mooremama – thanks for the comment! I love “seeing” who’s reading this here blog.